Short of a Hollywood tour, this is the definitive list of famous fictional homes. Movies and TV shows are memorable for colorful characters, great lines, and often, the fabulous homes they depict. Let’s take a tour of the 8 most beautiful TV and movie homes. Meredith Grey’s craftsman on Queen Anne Hill in Seattle, Washington attracts fans each and every day. 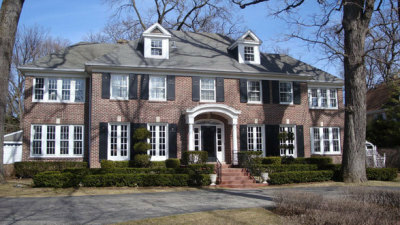 The McCallisters’ red-brick Winnetka, Illinois Georgian recently sold for $1.585 million. The stately plantation house immortalized in Forrest Gump wasn’t really a house—it was a set constructed just for the movie on an 8,000-acre South Carolina plantation. The twin turrets at 2640 Steiner in San Francisco were home to Robin Williams’ most memorable character, Mrs. Doubtfire. It recently sold for over $4 million. The Wayne Manor from Batman Begins is actually called Mentmore Towers. It’s a famous 19th-century English country house. The Cohens’ Newport Beach, California “McMansion” was everyone’s favorite TV house in 2003. It’s still pretty beloved—it was on the market for $6.25 million in 2016. Did you know? The famous mid-century modern house atop Mt. Rushmore in North by Northwest is actually a matte painting made to look like a Frank Lloyd Wright home. The O’Haras’ Georgia plantation house was simply a stylish facade built on-set at the MGM studio in 1939. Looking for a movie set-worthy home to call your own? Call the Cheng Real Estate Group at 608.957.2683 to start the hunt for your perfect home.